The Michigan football team became the first Big Ten team to win the Citrus Bowl in five years with a 45-31 victory over No. 11 Arkansas. Trailing 31-24 with just 5:49 left in the game, the Wolverines rallied with 21 points in a span of 4:02 to win their 15th bowl game all-time. Anthony Thomas led the Wolverines with three rushing touchdowns and 139 yards on the ground. Thomas was named Citrus Bowl Most Valuable Player for his performance, while linebacker Sam Sword was named the Michigan Defensive MVP by the media for his 11-tackle performance. 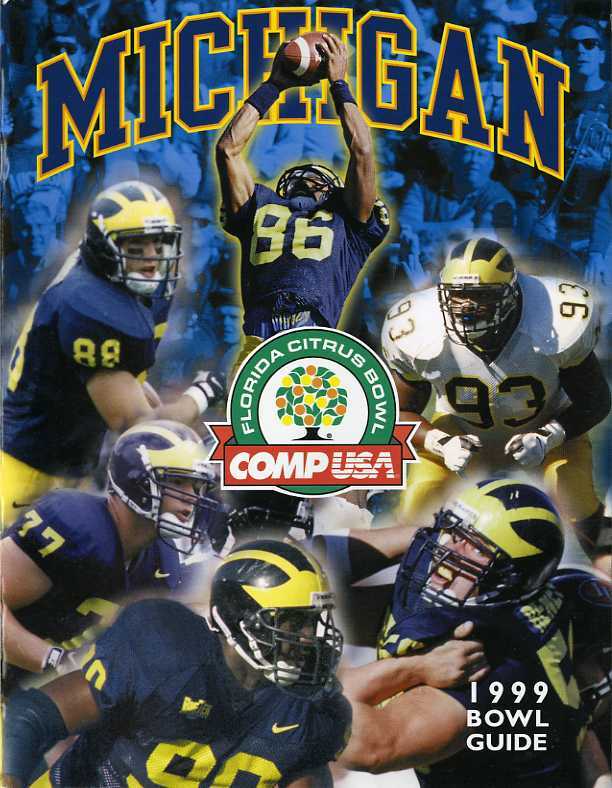 The Wolverines scored the games first points with 6:29 left in the first quarter when Jay Feely connected on a 43-yard field goal. Arkansas took a 7-3 lead on a 35-yard TD pass from Clint Stoerner to Michael Williams in the second quarter. Michigan responded with a two-yard touchdown run from Anthony Thomas, and a 46-yard interception return for a touchdown by linebacker Ian Gold. After Arkansas' Todd Latourette booted a 42-yard field goal to trim the Wolverine lead to 17-10, Michigan marched 69 yards in just 1:38 and capped the drive with a five-yard touchdown run by Thomas. The Wolverines took a 24-10 lead into halftime. The Razorbacks scored three consecutive second half touchdowns to take a 31-24 lead midway through the fourth quarter. Trailing for the first time since an early 7-3 deficit, Michigan responded with three consecutive touchdowns of its own. Anthony Thomas tied the game at 31, on a one-yard run. After the Wolverine defense forced the Razorbacks to punt on their next possession, Brady found DiAllo Johnson in the endzone from 21 yards out for the eventual game-winning score with 2:25 remaining. Michigan cornerback James Whitley sealed the victory with 1:47 remaining, intercepting a Stoerner pass and returning it 26 yards for a touchdown. Rushing-- (M): Thomas 21-132, C. Williams 19-72, Coleman 1-3, Brady 5-(-3); (AR): Chukwuma 17-56, Hill 13-35, Stoemer 8-14, Branch 1-9, Norman 1-2. Passing-- (M): Brady 14-27-2-209; (AR): Stoemer 17-42-2-232. Receiving-- (M): Streets 7-129, C. Williams 2-15, Shea 2-10, Terrell 1-26, D. Johnson 1-21, Thomas 1-12, Campbell 1-11, Knight 1-6; (AR): M. Williams 7-90, Lucas 3-63, Smith 3-19, Morreale 1~36, Hill 1-14, Davenport 1-9, Chukwuma 1-1.